Chris Melling was so sure he would not be getting a call from new Great Britain coach Tony Smith that he had booked a holiday to Ibiza for himself and girlfriend Ruth. But the trip to the Balearics will have to wait now that the Harlequins full-back has earned himself a place in Smith's 23-man squad for the Test against France on 22 June. "It came as a total surprise," said the 22-year-old Melling. "A few people had suggested I might get picked but I didn't think it would happen. "I thought I'd been playing well but not good enough to get recognised." Melling is in his first season with the London-based Super League club and has wasted little time making his mark. In his very first competitive game, the former Wigan man played a key role in the shock win over reigning champions St Helens at a cold and snowy Knowsley Road. Solid and dependable with an eye for a gap, Melling has continued to shine in the number one shirt and has quickly established himself as a firm favourite among Quins fans. But his worth to the club and his popularity amongst supporters has suddenly and unexpectedly escalated following his call-up to the Lions squad, albeit an under-strength one given Smith's desire to rest several established stars. For too long, moving to the capital was seen as a retrograde step for a player. Sure, it gave him first-team rugby and a decent pay cheque for as long as he wanted to remain there, but as far as furthering his career? Put it this way, only one player has ever won a full international cap for Great Britain while based in London. Tulsen Tollett was part of the Lions squad that toured Australia and New Zealand in 1996, but you have to go back to John Dalgreen in 1982 for the one and only London player to pull on the GB jersey in a competitive fixture. Many will argue, with some justification, that the club has hardly been a hotbed of home-grown talent, given its reliance on players from the southern hemisphere in past seasons. But thankfully for British players currently plying their trade in the capital, not to mention the game's wider appeal, the rugby league landscape is changing. Rob Purdham, who swapped Cumbria for London five years ago, was handed the England captaincy last season while more and more players from the so-called heartlands are being tempted to make the switch to Twickenham. So much so that British players are no longer in the minority in south-west London. Where once Antipodean accents dominated, now they are being drowned out by those of Lancashire, Merseyside and Yorkshire. Melling is not the only Quins player in Smith's squad. Goal-kicking centre Paul Sykes, born in Dewsbury but now in his fifth full season with the club, is in there, too. Harlequins skipper Purdham would have probably made it as well had he not suffered a season-ending back injury three weeks ago. But Melling's selection is the more significant of the two. Discarded by his home-town club Wigan just last winter, he has, under the guidance of Quins coach Brian McDermott, gone from a kid with potential to one of Super League's top performers in 2007. In other words, he has only enhanced his career by coming to London. 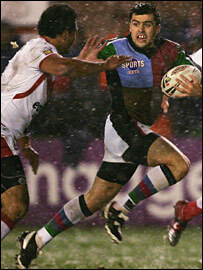 "I hope people will start to change their view of Harlequins," said Melling. "We are not just a club making up the numbers, we are a club producing players that can make the step up. "With myself and Paul getting a place in the GB squad, maybe other players will have the confidence to come to London."